Wider estate open all year, dawn till dusk. Small coaches only, by arrangement (max. of 7.5m, 30 people). House and garden: adult £8.10 (£7.30), child £4.10 (£3.70), family £20.30 (£18.30). Parts of Manor may be under repair. 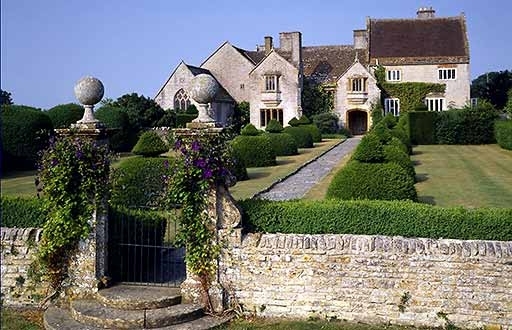 The garden with its multitude of shades of green and low yew hedges beautifully sets off the golden colours of the house and walls crouching for shelter in the flat Somerset farmland. Sir Walter Jenner planned a series of enclosures with simple but very effective themes which Christopher Hussey called 'a necklace of garden rooms strung on green corridors'. The main beds display a colour sequence with Berberis, Achillea, Aster, Purple Sage and many floribunda roses leading into the White Garden with 'Iceberg' roses and Philadelphus. Sweeping lawns, more yew hedges, clumps of pink and white Rugosa roses and an ornamental orchard which, with pairs of crab apple trees, medlars, quinces and walnuts is undersown with daffodils and wildflowers, looks spectacular in Spring. Further on enclosures with a hornbeam tunnel, a tranquil pool, a lawn with a stone seat and pair of strawberry trees make this a lovely garden for quiet contemplation and satisfaction. Lytes Cary was the home of the Lyte family from 1286 until the late 18th century. One of the family, Henry Lyte, translated Doden's text on herbs, the 'Cruedboek', from the Flemish in 1578. A copy of this is on display in the Great Hall. Sir Walter Jenner acquired the property in 1907 and set about restoring the house and transforming the garden. The National Trust used his design after the property was bequeathed to them in 1949 and began replanning and replanting the main beds in a scheme reminiscent of an Arts & Crafts style garden.